When I was a child, living in San Francisco, I was taught that I lived in Northern California. Disneyland and Hollywood were south of us, thereby making them Southern California. Okay, that's cool. As I got older, and traveled up and down the state, there was Central California. Then there is the central valley, the north coast, central coast...It gets confusing to an outsider or new transplant. Low and behold, when you take I-80 out of San Francisco, and head toward Sacramento, you head toward the real Northern California. 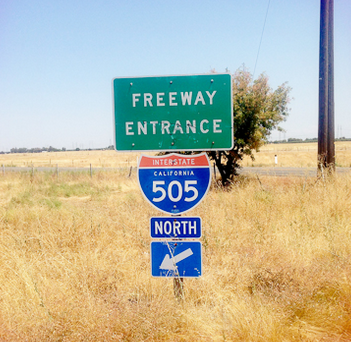 Take 505 from the I-5 to later connect to I-5 going north toward Redding. Many people are shocked when they finally get off I-80 - leaving behind the hustle and bustle of traffic, shopping malls, crazy drivers and fast food. Just a few miles on 505, it's country. Farms, ranches and small towns - a totally different part of California, that the rest of the nation does not even know exists. When I now hit 505, I can finally relax. I put her in cruise and enjoy the drive to my new home.